For those that have seen 'SLASHER HOUSE' (review here) and recognise Thorn, this film is a prequel to that effort and gives us more of a back story to what is surely the best killer in that film. 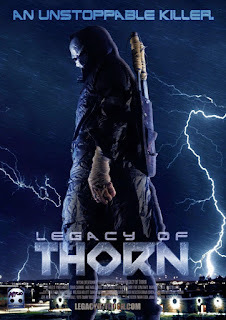 Opening like a homage piece to 'Jason Goes To Hell', Mj Dixon's 'Legacy Of Thorn' is a straight forward 80's throwback slasher brought into modern times. The film is a simple format as we follow a group of teens as they battle against Thorn who had previously killed their friends in an encounter four years ago. We get to see this within the film through flashbacks from present time to the previous four years which at times can leave you confused as to where you are. 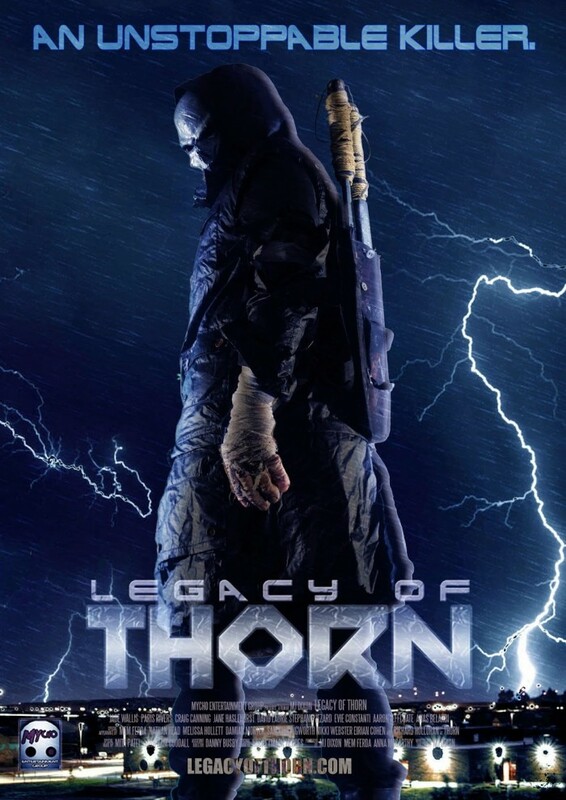 Can't say much about the character of Thorn as this would spoil the film but lets just say if you liked Jason Voorhees you will like this guy. Plenty of nods to previous slasher films are evident from this effort from Mycho Entertainment as is plain to see from the opening sequence, to how powerful Thorn is (Jason Voorhees - Friday The 13th), his uncanny ability to appear from no where (Michael Myers - Halloween) even down to stalking children (Freddy Krueger - A Nightmare On Elm Street). The special effects have improved quite a bit since 'SLASHER HOUSE' allowing them to explore different avenues in a convincing way including cgi which is used minimally. Though some of the acting isn't great this can be ignored as our unstoppable killer Thorn slashes his way through victim after victim including a horde of fresh out of the academy police officers that get maimed in minutes! Some cheesy lines are added in as well for good measure, but these are more cringe worthy then funny. The films end credits roll on confirming in James Bond style that Thorn will return in 'WRATH OF THORN'.